"In 1933 Adolph Hitler and the Nazi party rose to power in Germany. They immediately acted on their ideology of racial discrimination and violence." As Adolph Hitler made his rise to power in Germany in the early 1930s, the Jewish population began to feel the impending violent squeeze put on them by the growing power of the Nazi party. Though no one could possibly imagine what would eventually occur, as with the hell on Earth of the concentration camps, some Jewish families heeded the whispered speculation and struggled to leave the country. Without proper papers and visas in order to head for America or other points in Europe, the only avenue open was an 8,000 mile journey by steamship to Shanghai, China, a place that didn't require the usual stack of hard to obtain paperwork. 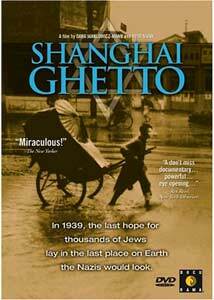 In Shanghai Ghetto, documentary filmmakers Dana Janklowicz-Mann and Amir Mann explore this largely unknown exodus in a haunting film that presents a chapter that I'm sure many people just are not at all aware of. By interviewing people who lived through this trial, including Janklowicz-Mann's father Harold, the narrative is told in the remembrances of these adults, recalling life as young children fleeing their homeland with their families, and settling in Shanghai, a place that one individual refers as "the shock of a lifetime." They found themselves subjected to deplorable living conditions, little in the way of food, nonexistent sanitation and, by the time the United States entered the war in 1941, the Japanese-occupied section of Shanghai became a prison-like ghetto; by this time the situation became eerily similar to what they had left behind. Martin Landau provides some sporadic narration to fill in some historical cracks, but the core of Shanghai Ghetto is built on the personal recollections of the people who lived through it as children, and it is their stories that hammer the hardest. It is clear that even though this occurred sixty-odd years ago, the horrible memories are as raw as if they happened yesterday. One of the participants recalls having to put bowls of rice on their window ledge to allow the warm sun to draw the bugs out, or another of the horror of having a brother contract polio under such conditions, and the tears flow just as freely as if these things had just occurred. Those who made it to Shanghai escaped something far worse than what awaited the six million that died under the Nazi fist, but that doesn't make what these individuals lived through any less numbing. The complexities and hardships were nearly as pronounced, and, hearing the stories, they seem almost insurmountable. As a history lesson, this was largely news to me. I'm not what would be considered a war buff, but I've watched and read countless things on Hitler and the Nazi's reign; I honestly don't recall hearing about the path to Shanghai taken by so many desperate Jews. And it is truly one hell of a story. Image Transfer Review: Shanghai Ghetto has been released in its original 1.33:1 full-frame image, and utilizes a mix of archival footage and photographs, as well as modern-day interviews. The archival material varies in quality, though I've seen some of the stock footage in other docs (ironically the very next day after viewing Shanghai Ghetto), the clarity here seemed comparatively sharper. The interviews don't have the same richness as a traditional feature, but colors are presentable, with no major blemishes to contend with. Audio Transfer Review: Audio has issued in its original 2.0 stereo, and as a documentary the presentation is driven largely by traditional interview segments, which sound clean and clear for the most. A couple of the segments feature a slight hum, and it's hard to determine if it was background noise during recording or some flaw in the transfer. Martin Landau's resonant narration has pleasant richness, and the original score from Sujin Nam, performed by Karen Han (Crouching Tiger, Hidden Dragon) is used sparingly, but to great effect, even under the relative constraints of the stereo mix. Extras Review: Filmmakers Dana Janklowicz-Mann (daughter of one of the interviewees) and Amir Mann provided a full-length commentary track, and it is a strong compliment to their documentary. Aside from fleshing out some additional historical aspects, it covers their initial research, beginning in 1997, on through the film's release five years later, with their struggle to hit a fair balance between emotional storytelling and documentary. The pair address the challenges of shooting some of the sequences in modern-day Shanghai, but the crux of the track is the Manns' desire to tell this very personal story in a way that would be relatable to film audiences. There are also three deleted interview segments, running nearly 30 minutes, as well as a full set of Docurama trailers. The disc is cut into 16 chapters, and features optional subtitles in English and Hebrew. Docurama's Shanghai Ghetto addresses an often overlooked, or just plain unknown element of Adolph Hitler's violent reign, that of the few thousand Jews who were able to flee Germany and book passage to Japanese-occupied China, and then found themselves living in completely alien conditions in horrible squalor. Filmmakers Dana Janklowicz-Mann and Amir Mann allow those who were there to recount in their own words what it was like, and their stories are understandably emotionally hard-hitting.